A big piece of our life is kites: kite building and flying, kite travels and teaching... and our web page tries to share that with you. Click on the buttons below to see different festivals, galleries and information. You can find many of our kites in "OUR KITES", using the button above. Below are some of our favorite kites, a few unusual ones, and a project or two. Bob and I have been busy the past couple of years. Less kite flying due to our horrible weather and several long road trips. Playing with grandchildren. Making wine trips into Oregon. Yard work and my quilling and Bob's woodworking. Just a happy life! But it definitely has included kites: building and flying. I have been remiss about posting our kite pictures. But I have done the 2012 gallery and it's sub-gallery of our second Hip Pocket Hybrid project and our 2013 and 2014 kite galleries! We had a great time at the 2014 Callaway Kite Flight in Nebraska. Flat Stanley flew over the pasture, posing for a photo op with a hay bale back drop and we got to fly the Ft. Worden Windbow. Replica Hi-Flier and Top Flite kites. Remember how trees used to eat the paper diamond kites we had as kids? For our Indian replica we used ripstop nylon and scaled it up to a little over 5 feet tall. We have 16 now in this series; click to see our Hi-Flier Project or use the button at the top of the page. You will see our finished replicas plus an explanation of how we make them. Classic designs: the Indian, the Man in the Moon, Sky Rider, the Jolly Roger, Strat-o-flier, Cloud Buster, and more! The newest one is the Atomic Rocket. We make replicas of historical kites. We use modern materials (ie. ripstop nylon, arrow nocks, carbon rods, spectra line, etc.) instead of paper, linen and cotton fabrics, bamboo and wood spars. We sometimes resize them, once in awhile add graphics, and always make them more portable. For example, our 1910 Gomes L' Aero reproduction kite - which is the yellow and black one to the right - needed an important revision before we finished it. The rods were specified to be 9 feet long and there were no provisions to break them down for transport. The sticks were to be sewn into permanent sleeve-pockets. This is hard to carry without the horse-drawn wagon! We had translated only part of the German plans before getting started on the kite, thinking we had enough information. Over the years we have gotten much better at our replicas. One of my favorites is the Compound Cody with a top sail. To the left is the round kite made for the 1999 Muncie AKA convention. It's a Celtic design and flew with long, red satin ribbon tails. It was a challenging reverse appliqué project. Click on the picture to see her flying. This kite was a nightmare to put together. We decided to turn her into a soft kite, getting rid of all the sleeves, spars, cross spars, and pockets. It still needs tails, more so than before. They are very long fuzzy tails to give her stability and to help her figure out which way is up. Now we open up the bag, shake her out and let her fly. This is what kite flyers call line art, line laundry, line garbage, line junk, or line jewelry depending on your point of view! We have our blue line, our yellow & black line, the pink and green line, the Koi, the spiky ball plus variations, the fish, the flock of ducks, the baby elephant herd, the corkscrews and spinning things. The 2002-2003 line laundry project was fluorescent yellow and dark purple. We have 7 pieces in this display. Bob designed 5 of the pieces on this line and they are very wonderful and very different from the rest of our lines. The other two completing the set are my favorites, a Roland's caterpillar and another Zwirbel. In 2016 we retired the pink and green line as the colors had faded and it looked muddy in the sky. We replaced it, duplicating the shapes but used dark blue and fluorescent yellow. The little pink and teal kite flying above the line laundy in the picture to the left is a Dondai, a French design. It is unique in that it flies big wings to the front or rear. It will fly with or without the transition tails we have for it. It's spines are about 5 feet tall. The corkscrew or Zwirbel line laundry was designed by a German friend, Bernd Knupfer. Wadsworth Spinners or Rotating Box kites. The two pairs of boxes counter rotate and were designed by an English gentleman, Nicolas Wadsworth. It is a great looking kite in the sky, simple to make, assemble and fly. 3 stack of Eddy kites arranged on a single spine with very interesting rigging. We found the Means Kite in Paul Garber's book "Kites and Kite Flying", published by the Boy Scouts of America in 1931. It is a very smooth flier and was designed by Mr. James Means in 1895. 2014: More road trips including one long trip to the Midwest. We saw bison, archeological digs for dinosaurs, caves, hiked in the Badlands and returned to Callaway, Nebraska for the Kite Fight Festival. 2013: Bob retired! Road trips, kites, relaxing. We definitely recommend our new lifestyle. Jimmy Pentagon finally made his appearance at our house, the Uhl project happened, more cotton kites and a new Mezger for us with my Chinese Zodiac symbol, the snake. 2012: Hip Pocket Hybrids were the kite of the year. A very nice kite for children. This project can be found here. 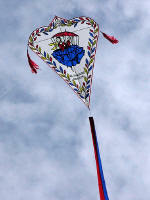 2011: We made several classic kites this year including the Russian Prachov kite from 1909. The year flew by with few new kites; a good year anyway! We have also been working on a very interesting project with the J.R. Edmunds kite. It was made in Wray, Colorado during the 1940's. We have built our replica, done lots of research and I will be working on a page devoted to this project. 2009: did not start out with kite flying. EEK! Our traditional New Year's Day fly at Golden Gardens Park in Seattle was rained out for us. Bob's Christmas kite, a soft kite this time, has not flown yet. And it is March 1st today. Will our weather ever be nice on the weekend with the wind blowing from the ocean? And to answer that question, we did finally get to go flying. We found a little park in Tacoma which was nice for trying our Ft. Worden creations. Mid-April we escaped to the coast and pretended we had enough wind to fly. My Korean Wave train was beautiful and Bob's swan was the champ of the day. But happiest of all was our being able to fly the new Pear Top. Look in "Our Kites 2009" for photos. The train is back in the 2008 gallery. We still have unflown kites but they needed that elusive 1 MPH more wind. 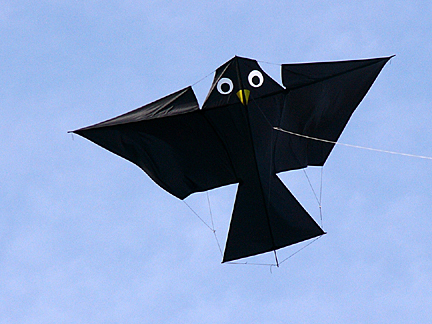 We have gotten several inquiries about the Pear Top kite we made in 2006. I took photos to answer one question and decided to give our Pear Tops their own page. If my new page doesn't solve all the mysteries, questions are always welcome. First kite event is of course the New Year's Day fly at Golden Gardens Park in Seattle. The day was completely without wind. A couple of folks dragged their kites through the sky as they walked the length of the park. Glenda blew bubbles which DID NOT blow away, just fell to the ground in a pile. Bob and I chatted with friends, drank coffee, and stamped our feet to keep warm. We took Flat Stanley. Bob opened up the Christmas kite Christmas morning and designed the complicated sticks. We had high hopes of having him in the air. Not to be. But you can see him posed with Marla Miller. 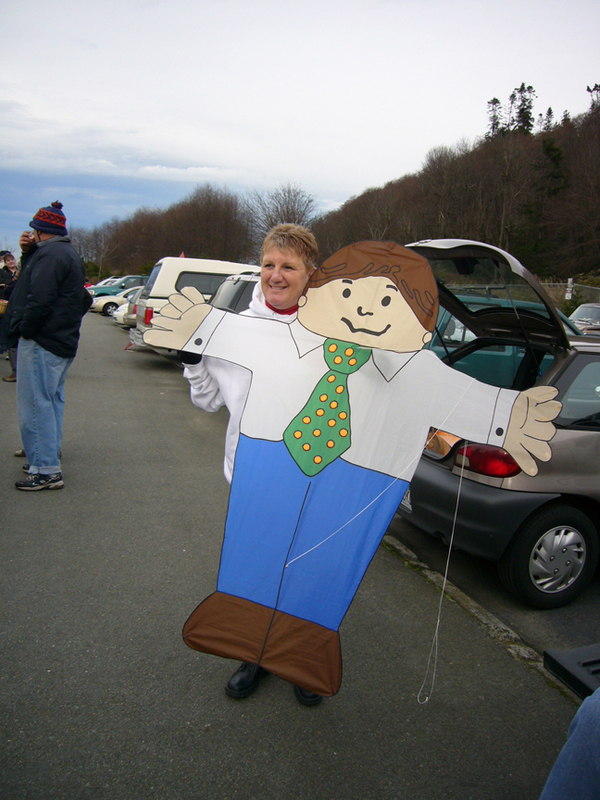 If our weather ever decides to give us a nice Saturday, Flat Stanley will be headed to the Washington coast. Ken Conrad posed with his stunning rokkaku with it's printed skin. Amazing and beautiful. I am in Ken's Ft. Worden class, looking forward to my own design printed on ripstop. The kite will be a Ohashi variant. We did teach at Ft. Worden. Hopefully there will be a few new Arno Haft replica birds in the air this summer. Make your own bird with our plan and instructions found on the Hints, Tricks, Plans page. I have added a new hint on our Hints, Tricks, Plans page. Cutting fuzzy tails is a pain at best; read about my methods for fewer cramping hands and shortening the time cutting takes. Our trip to Fanø, Denmark is all arranged. And a few of new kites in the making include a train, an arch, and a cody. More house remodeling has been accomplished with more planned. We will fly to Florida for my son's wedding and then continue on to Belize for sun, warmth, sea breezes and snorkeling. Plenty to keep us out of trouble! 2007: 2007 is gone! We made some wonderful new kites including 2 classics. I helped a group of Ft. Worden students make a piece of line laundry called the Stella Octangula. I posted the instructions and a set of photographs of construction stages in our Hints, Tricks, Plans. Try making one yourself and send me a photo. Ft. Worden was a great time as always. The photos are in a short slide show. Bob and I also taught a replica Arno Haft bird kite at the World Kite Museum in Long Beach in the spring. There are several beautiful birds which will be flying this summer. It is a wonderful size for just about anyone to handle and flies nicely in quite a wide wind range. Fanø 2007 and our European vacation are wonderful memories now. Yes, we will go back next year and hope we survive the horrible Euro to US dollar exchange rate. Look at the rest of the kites we have made this year in the 2007gallery, including Bob's Christmas kite, Flat Stanley. 2006: Our agenda for 2006 included teaching the Potter replica at MKS and the Roi des airs or King of the Airs replica at Ft. Worden. Both were great classes with wonderful new kites made. Unfortunately there was not a Kites On Ice 2006. We went up to Canada for Whiterock's April festival and had a wonderful time with our friends. Saturday was a very wet day but any time spent with friends is worth a drenching! Fanø again was truly wonderful and should be on every kite fliers list of festivals "I really want to be at". We missed Sam more than we can express. We flew a kite for him and will every time we are on a beach. Our February trip to Madison, Wisconsin is in the Kites On Ice section. Access it from the menu above. Ft. Worden 2005, another successfully fun time. One of 2 teaching adventures this year with the other at The World Kite Museum in Long Beach Fanø 2005: We made a slide show of 160+ pictures for you to see (access it from the menu above). It may take a while to load but once loaded, click on the left button to let it run. One picture automatically follows the next. The right button will stop the show. Use your back button to return here. Westport festival: This has always been our favorite local festival. 2005's proved to be no exception. We only went down for Saturday. There were many kites in the air on the other end of the beach. Our end, where our friends had parked, had the handcrafted competition field but we did try out our new King of the Airs replica. What a flier! We flew one of our Garber Target kite replicas as well. It is amazing to see a World War II kite flying again, replica or not. Click on the Westport 2005 button above or here. We made it to WSIKF again this year, flying in the dunes. And for the first time, we drove up to Whidbey Island for their festival. Very fun, although the winds were so very, very light, and we hope to go again. We went to our favorite flying spot at the ocean beach a few times, remodeled 2 bathrooms, built a few other kites, got together with kite friends several more times and scratched our heads wondering where the year went! One kite we built in 2003 is a Cody Compound and I am really proud of it. This was a tough project taking several months. We spent a day at the beach in May, 2003 and were able to fly it. The wind was 10-11mph. It was not complete as it stands now but the basic kite was done and flew so well. We added a top wing. Bob has a copy of an old picture of a Cody Compound with a top sail. The trailing edge of the sail is not visible but we decided to chance what it probably looked like. It was finished and the completed kite had it's maiden voyage on Fanø. Other 2003 kites included a Pormortzcheff or Russian kite made from modern materials and a classic kite made from cotton and bamboo: the Cerf-volant Anémometre. I have put photos of all the kites and laundry we have made in 2003 and 2004.